A MCN reader recently wrote telling about his enthusiasm for Reg Pridmore’s “body steering” method of initiating lean for cornering. What follows is my response. This discussion has been going on for over a decade and has even sparked an Internet rivalry between Pridmore and Keith Code, who advocates and emphasizes countersteering as part of the California Superbike School as the best way to initiate lean. Having ridden the CSS No BS bike (which has handlebars mounted rigidly to the frame with a working throttle), I can confidently tell you that body “steering” alone will not allow a rider to corner in any meaningful or effective way on a 400 to 800 pound machine. See the video of Code riding the No BS bike to see how little body position has on direction control. Yes, body “english” can enhance many aspects of cornering process. I am a very big proponent of body positioning for both street and track riders to aid quicker turning, refine cornering lines, increase ground clearance, preserve traction, and allow the rider to interact more with the bike and the road. But, body positioning alone cannot cause the average street bike to initiate a corner efficiently or quickly enough. That is done by countersteering. Countersteering uses the geometry of the bike to essentially unbalance the machine, causing it to drop into a lean. There are many other aspects of the process, but that’s all most riders need to know. You mention the other important aspect of masterful cornering, which is relaxing the arms as much as possible once the lean is initiated and using smooth control inputs to maintain control. I have no doubt that your revelation and enthusiasm for Reg Pridmore’s fine book and teachings are genuine, but I can guarantee that you are using countersteering (in combination with body positioning) to lean your bike into a corner. What is happening is you have replaced some of the “handlebar only” countersteering inputs you have used routinely for many years with a body position technique that is “pre-loading” the bike for the corner. This shift in the center of gravity causes the bike to fall into the turn easier, making it feel as if you are not putting any pressure on the handlebars. This is a technique taught by Lee Parks in his Total Control curriculum and which I teach to track day students. Next time you go for a ride, pay very close attention to the amount of pressure you are putting on the handlebars as you initiate lean. If you concentrate enough, you will surely notice that you are introducing handlebar pressure. Because there really is no alternative to countersteering, only reducing the amount of pressure needed. Additionally, the act of moving your body in the direction of the turn causes handlebar inputs. You would have to consciously resist pulling the outside bar or pressing on the inside bar to eliminate any countersteering force, which would be very difficult to do. I’m glad you feel more proficient. Keep doing what you’re doing, but you’ll be better off if you know what is really happening. Good luck. I received a reply from the reader. He is sticking with his belief that he is not countersteering. A suggestion for another situation to examine for those who think they don’t countersteer is to ride figure eights in a parking lot and pay close attention to the bar inputs to change direction. Yes, Aaron. Parking lot drills, like the ones in my book can help convince people that countersteering is THE most effective way to get a bike to lean. Figure 8s, quick turns and swerves are a good drills to do that reinforce the countersteering technique. As always, your are correct, patient and polite, Ken. Your correspondent is in for a rude awakening next time he absolutely positively has to turn sharply RIGHT NOW. Yeah, there’s a fine line to walk when trying to enlighten folks. Too heavy and I come off as a zealot…too light and I risk not helping to save a life. It’s clear that he is countersteering, but refuses to acknowledge it. When I was a new rider I would have agreed with your errant correspondent, but not today. After only 19 years of riding I am in touch with my inner physicist – counter steering is a fact. I’ve ridden the California Superbike School No BS bike. It’s a brilliant and simple concept that proves a point. It was extremely disconcerting not to be able to countersteer to turn, and immediately settled any controversy for me. I’ve taken Pridmore’s CLASS as well, and can recommend both schools, but disagree on Reg’s theory here. Thanks for telling it straight! I’ve never liked how countersteering is treated as an auxiliary concept to ‘just riding’… it is just how steering happens on any two wheeled vehicle at any speed. I should also expose the myth that there is some minimum speed where countersteering becomes ineffective. We’re all still doing it even at “slow race” speeds, but the degree of bar movement and time till we see the desired response increases exponentially as speed decreases. Last Spring I was in a motorcycle dealership and on a 600cc machine sat a young man of 18 years. I asked him if he was new to bikes, yes was the answer. I asked him to show me the inputs required to steer the bike into a tight right turn, such as a on ramp onto a highway. He promptly turned the bars to the right…I told him without fanfare you might have just had your first accident because that is not how to take a right turn. I try and not come off as a jerk but I am really tired of even MSF course instructors not really explaining what is going on during cornering. I lived in Québec for 5 years and had to take their testing even though I held a licence in the US for 20 years. The closed course test had a great counter steeering element in it, and you could not pass the course without counter steering. Counter-steering is difficult to experience in an MSF course if new riders are not confident enough to get their speed high enough. Shuumai, I had a profound experience in the MSF course on the 135° decreasing-radius turn, and it perfectly illustrates your comment. This was a practice run after we had been through the course a few times. I was feeling confident and I hit that turn too hot, way too fast. In a desperate measure to not plow through the cones, fall down and “kill myself”, I pressed on the bar more, leaned right over, and turned right though it. It seems that I only got the light bulb to go off in my head after making a critical error. 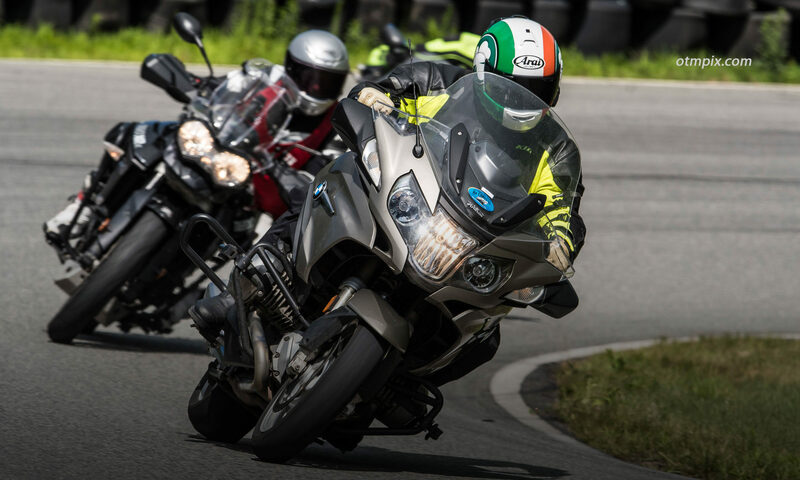 Desperation taught me what the instructors had been saying but what is so difficult to internalize: Modern motorcycles lean far over, and leaning is not scary but it is fun and comes naturally after some practice up to speed. The paralyzing fear that most novices have is a pretty sizable battle for the instructors to combat. If that’s the case ask him to lightly hold the throttle with his thumb and index finger and negotiate a left turn at speed. As a newer rider, I mainly practised counter-steering at first. Then I added body-steering. The two definitely work best together. Counter-steering works alone and body-steering /seems/ to work alone, but I know that it doesn’t. I don’t hang off…yet, since I’m only riding on the street. I just shift my upper body in the direction of the turn and brace with the opposite knee. Feels very connected. One thing I feel is missing from most discussions on counter-steering is what happens immediately AFTER the lean is initiated. What is actually happening to make the bike turn? As a new rider I found myself increasing lean angle if the bike wasn’t turning enough. All that did was increase lean angle! What seemed to work was allowing the front wheel to “flop” back in the direction of the turn. That’s where being relaxed made the difference. After the lean is initiated, the bike must be /allowed/ to turn. Actively turning into the turn would, of course, just stand the bike up. I think it’s that passive part of steering that leads some people to believe that body-steering is actually redirecting the bike. Shifts in body weight only cause counter-steering to happen. Have you ever had a long straight road all to yourself and done the ‘happy biker weave’ down it just for fun? Then you’ve countersteered! The only way you can weave from side to side within a lane is by countersteering, start from the left hand wheel track, ease the right hand bar forward, the bike leans right and weaves to the right. Push on the left bar, the bike leans left and weaves left. No amount of climbing all over the side of your bike Moto GP style will make your bike do the ‘happy biker weave’. Moto GP riders only lean off the inside of the bike to move the centre of gravity to the inside and make the bike think it is leaned over further and turn tighter. Only countersteering will ease you through a corner, while you stay comfortably in your rider’s seat. I’m also a noob and, having searched endlessly on the net, I agree with Shuumai that not enough is said about what happens AFTER initially countersteering to start the turn! It seems to me if I keep on countersteering, the bike just leans over more and the front wheel feels like its pushing out from under me without tracking the corner. However, if I lean-in, relax and let the front wheel turn INTO the corner, then it goes round just fine! Once leant over, actively countersteering seems to tighten the line, whilst actively turning into the turn stands the bike up. This doesn’t seem to be emphasised much in the stuff I’ve read, which makes me worry I may be doing something wrong??! Fully support the countersteer procedure. While all bikes countersteer to go around a corner, in my experience some bikes need lots of pressure on the inside bar and others not so much. My mates VFR1200 needs immense amounts of pressure on the bar the whole corner. Relax that pressure a bit and the bike stands up, straightens up and wants to run wide. Scary and not imo a nice way to go through a corner. My 1200GS (and a previous 800GT) requires very little countersteer pressure i suppose by the leverage of the wide bars. Think left – go left pretty much. So maybe some people who do not agree with countersteer have lots of leverage or never go fast enough to make it apparent. As one posted earlier, he did not perceive countersteer till he went into a corner too hot and saved the day by loading up the inside bar and the bike went thru the bend and all was OK. Right, Paul. Also, bikes with narrower tires will also turn is easier, requiring little perceived countersteering pressure.